AS IT STANDS: A Question About Democracy: To See Trump's Taxes, Or Not To See? A Question About Democracy: To See Trump's Taxes, Or Not To See? 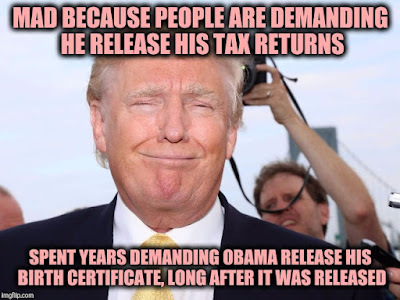 Theories about why Trump won't release his taxes have been trotted out to no one's satisfaction since he snuck into office. Because Republicans controlled Congress for his first two years, Trump didn't have to worry about releasing his taxes. None of the spineless jellyfish dared to stand up and ask for them. Fast forward to today. The Democrats control the House and one of the first things they're doing is going after those secretive tax returns. To know one's surprise, a pitched battle has already begun as Trump's minions try to derail the Democrat's mission. Democrats are confident IRS code 6103 gives them the power to request Trump's tax returns. House Ways and Means Chairman Richard Neal of Massachusetts is carefully deliberating the best way to get Trump's tax returns amid building pressure from activists on the left. Because this request is unprecedented, combined with the political drama surrounding Trump's returns, we can expect an extended legal review from the Treasury Department. Why? Simply put, the Treasury Secretary Steven Mnuchin is one of Trump's closest minions. Hard to imagine he won't do everything he can to thwart the Democrats efforts. Thus far, were embroiled in a Shakespearian drama that asks the big question, To See Trump's Taxes, Or Not To See?" Stay tuned for the final act.